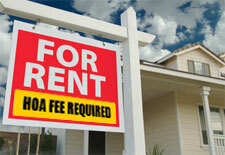 Imposing Fees on HOA Members who Rent out their Homes? The additional burdens that renters impose can be substantial for many common interest developments–especially those developments designed as “recreational communities.” Renters who lack a sense of investment in the community or who are unfamiliar with its operational structure can place greater strain on the community’s management and maintenance resources. This may not only frustrate other owners within the community, but may also significantly impact the financial health of the Homeowners Association (“HOA”) formed to preserve and protect it. We have written about how HOAs adopt and enforce rental restrictions as a means to alleviate some of the problems posed by renters. We have also published a resource explaining how new legislation taking effect January 1, 2012 will limit a HOA’s ability to restrict rentals in certain circumstances. However, in addition to imposing rental restrictions where possible, can a HOA impose a fee on owners who wish to rent out their homes? In the recent, unpublished decision of Watts v. Oak Shores Community Association, the answer may be yes. The Oak Shores development lies on the banks of Lake Nacimiento. Several members of the Oak Shores Community Association (“OSCA”) brought a civil action against OSCA to challenge the validity of its CC&Rs and the rules and regulations promulgated by the OSCA Board of Directors. The basis for the action was the allegation that the small minority of members within OSCA who live year-round within the development had discriminated against the development’s absentee owners by imposing what the absentee owners viewed as unauthorized and illegal fees on owners who rented out their units. These fees included a fee on owners who rent out their homes to tenants on a short-term basis (for periods less than ninety (90) days), a mandatory garbage collection fee, a boat and watercraft fee, a building permit fee and a property transfer fee. In addition to these fees, the plaintiff absentee owners also challenged the seven (7) day rental period minimum restriction as well as a rule limiting the number of automobiles and watercraft that renters are allowed to bring into the development. “…so long as a [HOA] acts upon reasonable investigation, in good faith, and in a manner the [HOA] reasonably believes to be in the best interests of the [HOA] and its members, its decision will be upheld.” Lamden v. La Jolla Shores, (1999) 21 Cal.4th 249, 265. The court in Watts went on to note that this judicial deference standard not only applies to a HOA’s recorded CC&Rs, but also to any rules and regulations enacted by the HOA’s Board of Directors. Provided that a HOA’s Board of Directors (1) has the authority to promulgate the rule or regulation at issue and (2) in doing so upholds its fiduciary obligations to the HOA by acting reasonably with a good faith belief that the action is in the HOA’s and its members’ best interests, courts will not strike down the rule or regulation. After finding that the OSCA Board of Directors (“Board”) was acting within the scope of its authority under the CC&Rs, the court turned to the reasonableness of the Board’s actions. The Board presented evidence at trial (1) that it had “repeatedly sought out professional legal and actuarial advice on multiple issues, and reasonably relied upon that advice in conducting its affairs,” and (2) that the additional strain on OSCA’s management and maintenance resources brought about by renters is significant. Therefore, the court concluded that the rules and regulations at issue were indeed adopted “in good faith, upon reasonable investigation, and with regard for the best interest of [OSCA] and its members” and that the Board has a “legitimate and compelling interest” in regulating rentals. One unique aspect of the holding was the allegation that OSCA had not complied with Civil Code § 1366.1, which generally provides that a HOA “shall not impose or collect an assessment or fee that exceeds the amount necessary to defray the costs for which it is levied.” The Plaintiffs asserted that OSCA “must precisely counterbalance the amount of money generated by any specific fee…against the exact costs the fee is used to offset.” Significantly, the court refused to require OSCA to show such as precise correlation between the fees at issue and the increased costs brought about by renters. Because OSCA relied upon two certified public accounts to show equivalence between the fees imposed upon short-term renters and the expenses incurred by OSCA for short-term renters over an eight (8) year period, the court concluded that a “reasonably close relationship” existed between each challenged fee and the cost for which it is intended to offset. The finding of such a “reasonably close relationship” was enough to satisfy the requirements contained in § 1366.1. Though an unpublished decision, the holding in Watts may provide some guidance to HOAs dealing with increased expenses brought about by renters in their communities. As in the case of OSCA, these expenses can be significant if the development is recreational in nature or if the vast majority of the properties in the development are regularly rented out. HOAs wishing to alleviate some of the problems brought about by renters should consult with legal counsel before determining the appropriate methods by which to do so– especially in light of the new legislation taking effect January 1, 2012. To read our previous blog post on rental restrictions, click here.